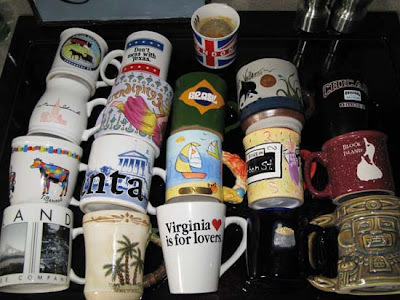 I drink coffee each morning and so I started to collect coffee mugs from all the places I visit. It's pretty fun because then every morning I wake up with a memory of a trip I've taken. atleast youre not collecting teaspoons..that would be werid.. Yea...I try and get mugs that represent the place I was visiting. The last one is a Mayan thing and it's kinda scary so I don't use it much. I think you are about due for a Maui mug! Gotta love the Portland Starbucks mug!! !